One week after she planted. 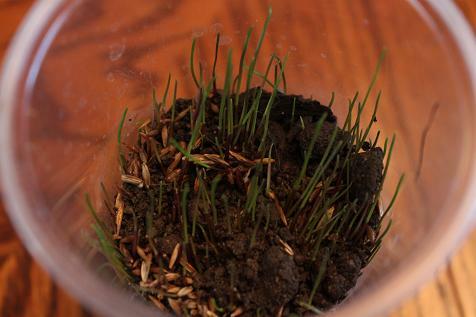 A better shot to see how much her grass grew in one week. That was on Monday of this week. 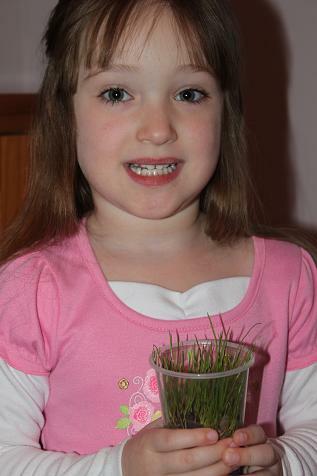 This is her grass today- it has really grown since Monday. Each morning it is noticeably taller than the night before. 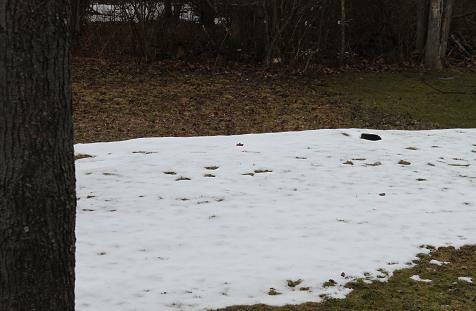 I am thinking we will plant in this area- I need to come up with a way to keep the deer and rabbits out of our garden though. Since our growing season is short we will probably have to buy plants that are already started. I want to grow things like tomatoes, lettuce, cucumbers, etc. As part of studying about gardening I have lots of activities in my Mailbox magazines that we will use. 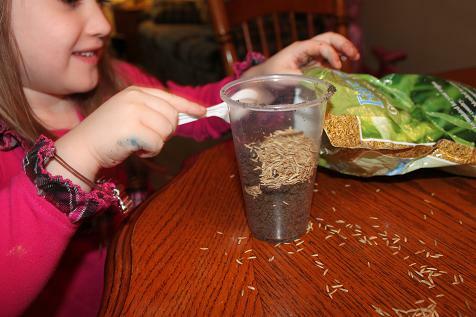 I am also excited to use the Garden Preschool Pack from Homeschool Creations to go along with our unit. We probably won’t actually do our gardening unit until the end of May when it is usually safe to plant. 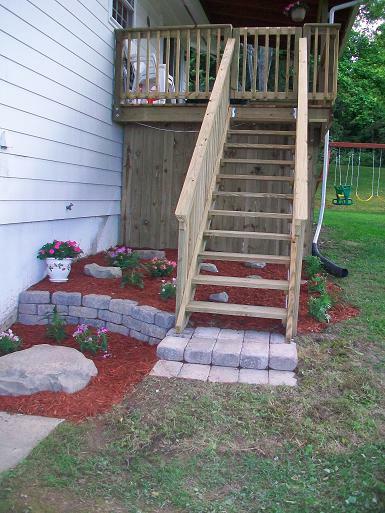 Rich rebuilt our deck last summer and we added some plants and landscaping. 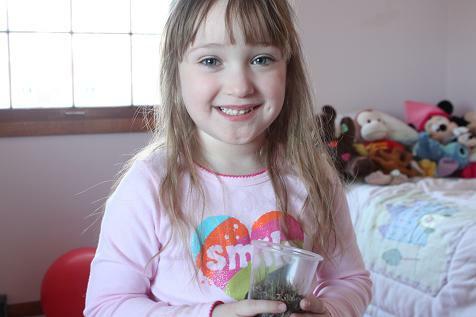 Hailey and I are going to do some more planting and add some more flowers. 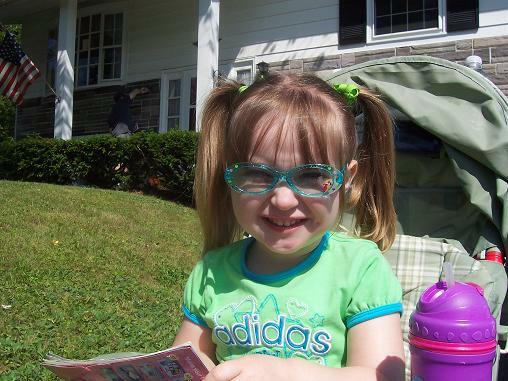 This picture is from almost 2 years ago- but behind Hailey is the front of our house. I really want to rip those bushes out (and have Rich rebuild our porch, but that’s another story) and add some nice flowers and plants there. So- there’s our plans for this spring/summer. Hailey and I are both excited to get started. 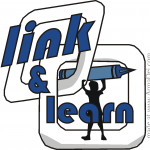 Check out what everyone is else planning over at The Homeschool Village. 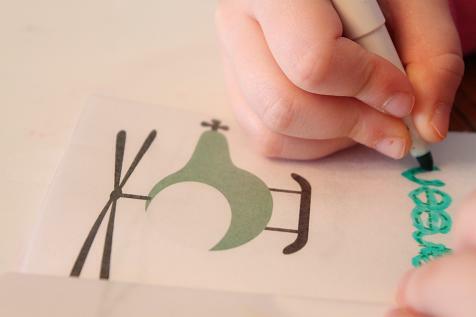 Hailey saw this helicopter activity in one of my Mailbox magazines and wanted to try it. 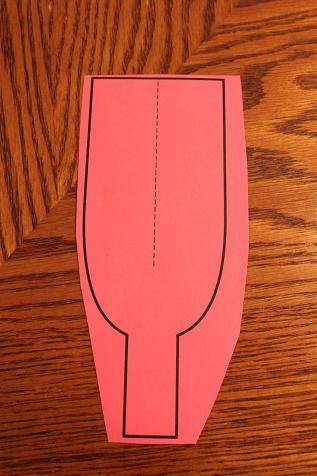 This is a pattern from a Mailbox magazine but it would be pretty easy to draw. I laminated it and cut it out. 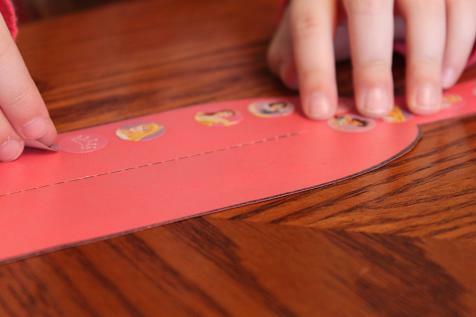 Then I cut on the dotted line. 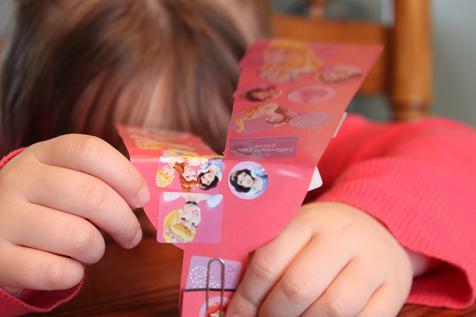 Hailey decorated her helicopter with stickers. I folded the bottom up about a 1/2 inch and put a paper clip on it. Then I folded the top part in opposite directions. Then we held it high up in the air and dropped it. The directions had said to hold it about 5 feet in the air but I had to hold it up next to the ceiling in order for it to spin a couple of times before hitting the ground. 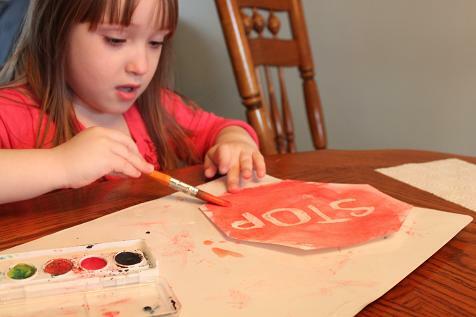 Hailey also made a stop sign. I wrote STOP using a white crayon on a piece of cardstock. Then she painted it red using water colors. Here’s a picture of Hailey enjoying the town we made yesterday. 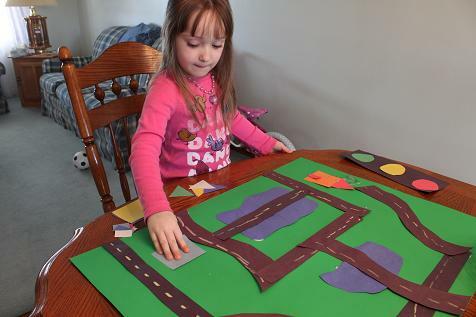 Continuing with our transportation theme we made a little town with roads for Hailey to drive her cars on. 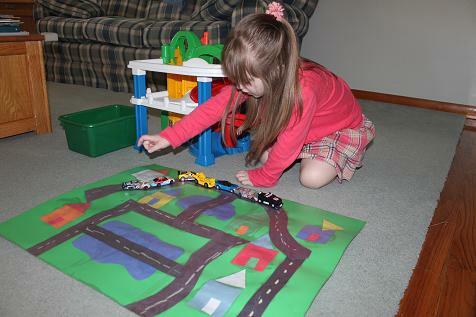 Hailey placed the roads how she wanted them and then she added some yellow chalk lines. 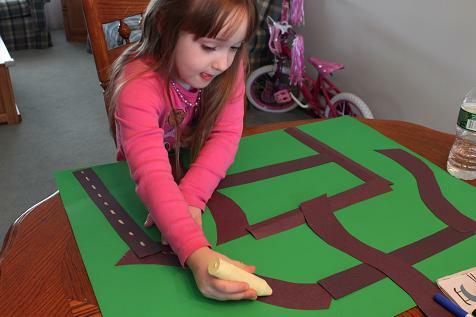 Then I helped her glue the roads where she wanted them. She decided we should add some water- so we put some water under a couple roads. 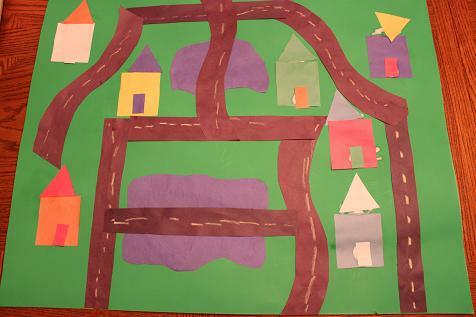 Then we added some houses. Hailey’s finished town. Once it is completely dry I am going to put contact paper over it so that she can drive her cars on it. 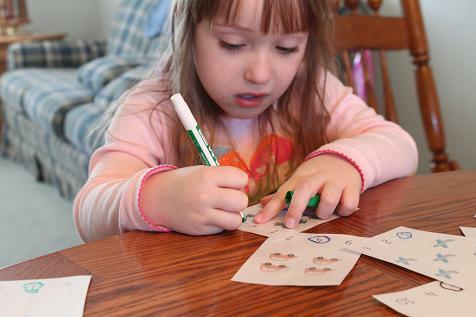 Hailey wrote the color words from the transportation pack from Homeschool Creations. 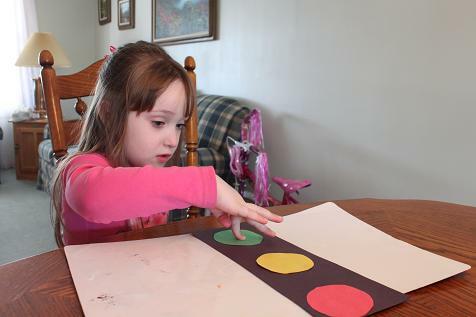 Hailey made a traffic light. 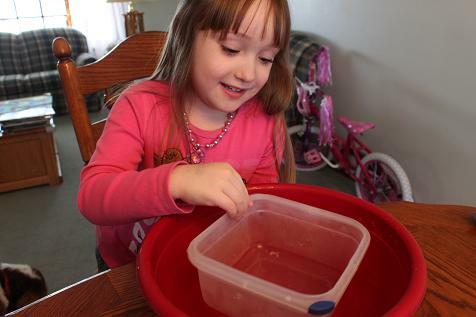 We did a little experiment to see what it would take to sink a “boat.” I put water in a big mixing bowl, then used a rubbermaid container as the boat. 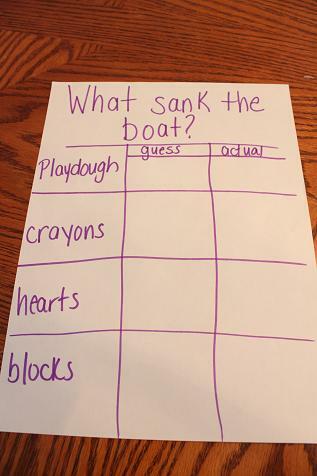 For each item on our list- containers of playdough, crayons, hearts and blocks- Hailey had to guess how many she thought it would take to sink the boat. Then we tested to see how many it actually took. 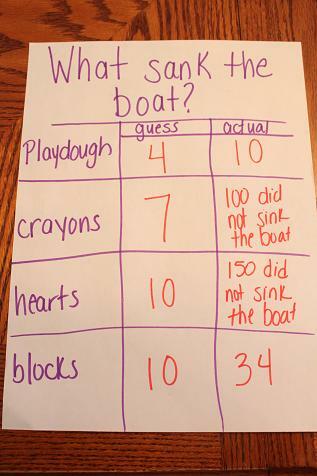 Testing to see how many blocks it would take to sink the boat. Our theme this week is transportation and today we made a train. 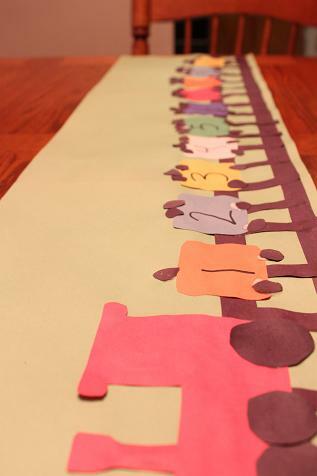 I taped together 3 sheets of green construction paper. Then Hailey glued on some railroad tracks. 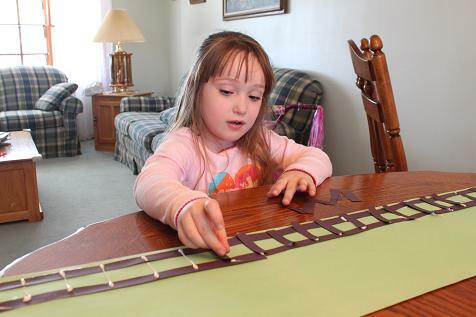 I put numbers on 10 boxcars to go on the train, so Hailey glued those on in order and added wheels. 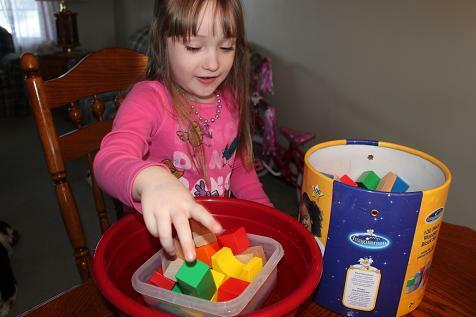 Then she added coal to each boxcar. The number of pieces of coal had to match the number on the boxcar. 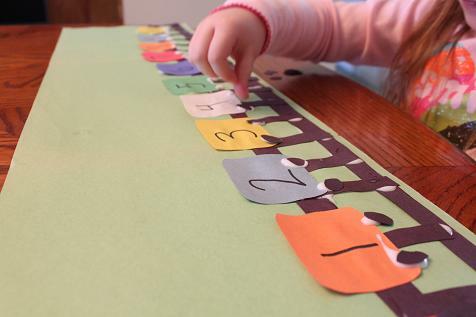 Hailey did a number match from the Transportation Preschool Pack from Homeschool Creations. 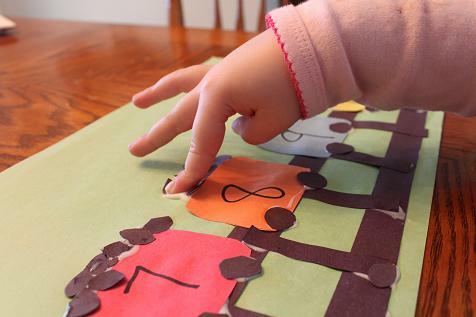 I laminated the pieces and she used a dry erase marker to circle the correct number.